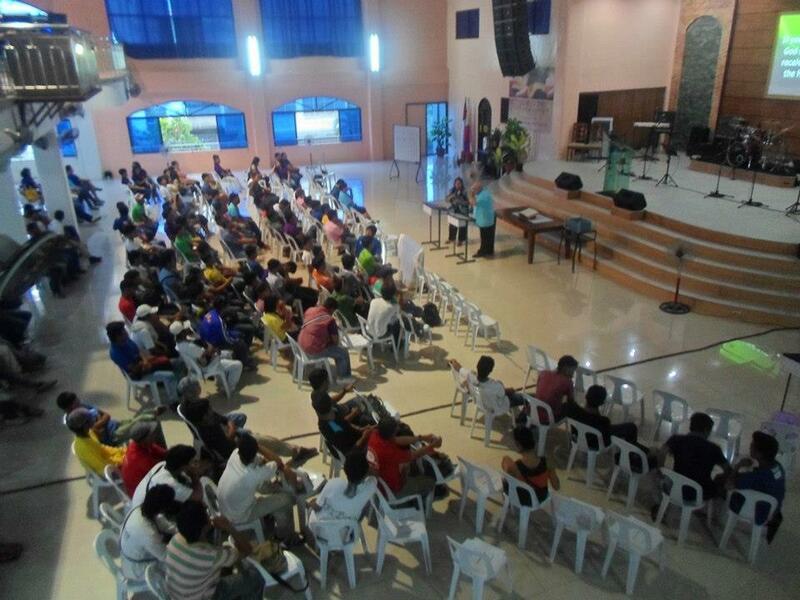 Last March 23, as an annual practice of HPCC, its Holy Week activity was held at CDO First Assembly of God church. This year’s Lenten activity was themed “Lead me to the Cross”, emphasizing the significance of the cross. One of the significant things happened on the cross was Jesus Christ’s seven last words. It has been a tradition for churches to commemorate the seven last words that Jesus has uttered when he was hanging on the cross. And for this year’s holy week service, Jesus’ famous seven last words were preached and elaborated by different speakers. It was a refreshing holy week activity in a way that some of the speakers were fresh pastoral graduates and some were first time speakers in a large group of people. The seven last words were also a refresher for some of the attendees and for some it was their first time to hear about it. The activity has touched and blessed the hearts of the attendees. They were physically, emotionally and spiritually satiated. The cross is the symbol of Jesus Christ’s unconditional love for us. Despite of our iniquities, transgressions and sins, God has sacrificed His son for our salvation. We were saved by grace and we should be grateful that we’re alive because of that grace. Surely no words can express that can be amounted to what the Lord has done for us; but still we want to say thank you Lord for everything. To God be the glory! It is HPCC’s commitment to ensure most satisfied customers, deliver highest quality service and continually improve its quality management system. One of the most important ways in achieving its commitment is thru the competence of its workers. Establishing rapport and building good relationship with the clients are contributing factors to having satisfied customers. These are also contributory factors to the competency of the company and its workers. Being competent measures the workmanship and attitude of a certain person toward its work. It is where we can determine how passionate one can be with its work. If one is passionate with its work; positive outcome and result will exude from it. As a way of showing how HPCC values its workers’ workmanship, the company has recognized and acknowledged the workers that have shown competence with their work. Last June 1, during the bible study fellowship, six workers were awarded with certificates and tokens for their outstanding performances from the month of January to April 2015. These workers were recognized for their competency and complete attendance which means no tardiness and absences in work. Congratulations to the recipients! Keep up the good work! For the workers who have received an award, HPCC hopes that this won’t be the first and last award that they’ll be receiving. May this award give them the inspiration to continue their good works in the company. And for the other workers, may this be an inspiration for them to do their best also so that they too will be recognized on the next awarding. Kudos! May 25, 2015 was another remarkable day for HomeChoice Planners and ConstructionCorporation as the company conducted its Vacation Bible School Program. This is not a new event for the company as they have conducted it in the previous years; only that this time around the workers’ wives are included in the program. It was a one day event that was attended by the company’s staff and workers’ children and wives. This year’s Vacation Bible School theme was all about “Knowing God”. In collaboration with the First Assembly of God church, the participants were taught by the volunteer teachers and pastoral staff of the said church. 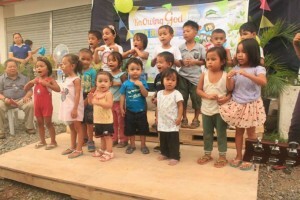 The whole day event was full of different activities; for the children they were taught to memorize verses from the bible, there were arts and crafts, bible storytelling and they were also taught to sing praise and worship songs. The wives did some similar activities also, only that it was suited for their age. At the end of the Vacation Bible School program, a closing ceremony was held for all the attendees. It was a graduation ceremony to commemorate their active participation in the VBS program. The attendees also showcased their talents by reciting the memory verses and presenting the songs that they have learned. It was a successful and fun filled one day only event of HPCC. Thanks to First Assembly of God church for the successful partnership. Cheers to all who took part in the event’s success. To God be all the glory! 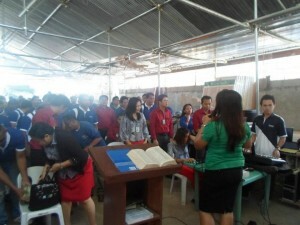 It’s an annual activity for HomeChoice Planners and Construction Corporation to conduct a service for the holy week. Every year, there’s always a theme that is set for the holy week service. This year’s theme was entitled “Under the blood”; where each guest speaker discussed the essence of being under the blood of the lamb. There were four speakers and each of them shared the significance of the blood of the lamb. Though each speaker shared different verses, it sums up to one important point; the grace that we have through Jesus Christ’s sacrifice for us. Our salvation is God’s way of showing His great love for us. That through Jesus Christ’s sacrifice, we have now full access to God. Jesus Christ tore the veil and made a way for us to get closer to His father. There’s no need for us to give offerings and sacrifices because Jesus Christ has done it all for us. He died on the cross carrying all our burden and shame; the great act of unconditional love. The activity ended with participants filled with knowledge and wisdom of God’s teaching. Thanks to the speakers; Ptr. Walter Ritchie, Ptr. Leah Ritchie, Sis. Iris Porras and Bro. Randy Pianar. The participants have indeed learned a lot from the speakers’ words of wisdom and encouragement. This activity gave the participants something to ponder for this Lenten week. Glory to God! Every Monday, HPCC workers gather at the company’s warehouse for the weekly bible study and fellowship. This fellowship has been the company’s practice for almost five years now. And just recently, another activity has been included in the Monday fellowship of the company. Retro Monday – is what we call with the newly added activity. 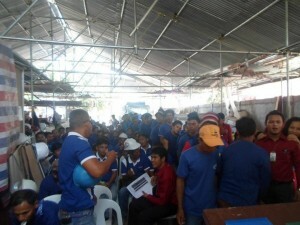 This certain activity started last July 15, where in songs and videos from the 70’s and 80’s are shown to the workers. And from those videos shown, they will follow the steps and dance in the tune of retro songs. This activity serves as an early morning exercise for the workers. This Retro Monday dance exercise has been practiced for two weeks now and it sure helped the workers in unleashing their dancing prowess. It did not only help them in boosting their confidence, it has also helped them with their fitness and health. We do all know that health is wealth and another way of achieving this is thru exercising. And dancing is one of those exercises. HPCC conducted this kind of activity in preparation also for the upcoming December event; that as early as now, the workers are already exposed to all the retro stuff. And with this, they will be ready as ever when the event will come. Here’s to a healthy living – kudos! This is one of the known verses in the bible that is telling us just how much God loves us. For our salvation, he sacrificed His own son to save us from all of our sins. It is God’s greatest way of showing His unconditional and unending love for us. Jesus Christ, the only son of our God, took away all our sin and shame. Despite of all the evil doings that we have done against the will of God, Jesus took account of it all and died on the cross. What an overwhelming feeling knowing that after all the wrong things we have done, God accepted us and forgave all our sins through the life of His son. With this, it has been an annual practice for us to celebrate the Lenten Season. Within this time, we take our time off from work and spend the week reflecting on the things that we have done be it good or bad. This is also the time where in we commemorate Jesus Christ’s death and the salvation it has given to us. 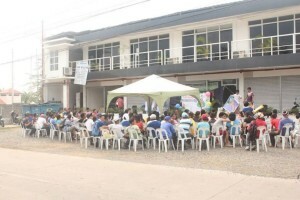 And as part of this celebration, HomeChoice Planners and Construction Corporation also took time off from work and joined in the celebration of the yearly Lenten Season. 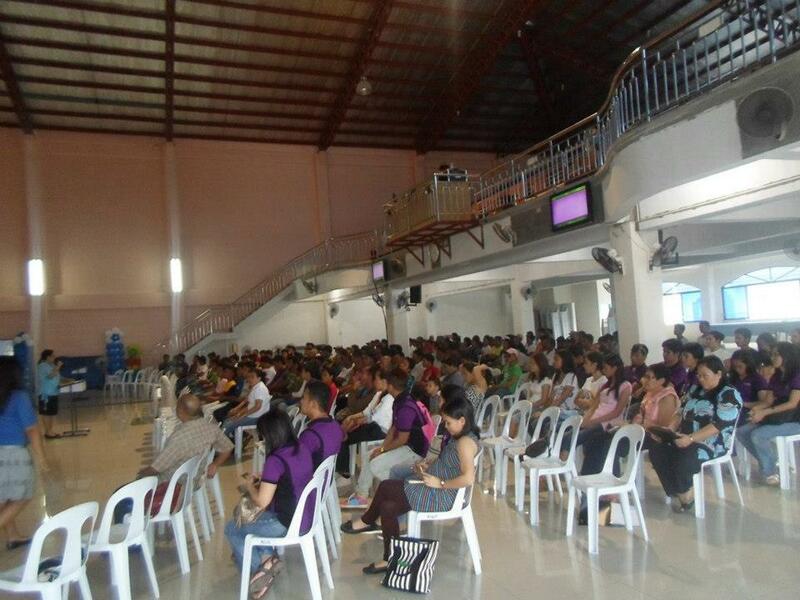 Last March 27, 2013, HPCC conducted a Holy Week reflection service at CDO First Assembly of God church. It was the first time that HPCC held its holy week service in the said church and it was a memorable one. The service had become more meaningful because we were graced by the presence of the four known pastors of CDO FAOG. We were privileged to have been preached by four different pastors that has tackled various topics for us. Ptr. Roger Ruiz taught us about the essence of water baptism. Ptra. Leah Richie, who’s the second preacher, tackled about the meaning of true worship; who, when, where, why and how should we worship God. And lastly, Ptr. Walter Richie, discussed about the roles and importance of the believer and Holy Spirit. Ptr. Elpie Taboclaon, the senior pastor of CDO FAOG also gave some additional insights to the topics that have been discussed. It was a spirit-filled day and everybody learned so much from the topics discussed. Reflecting on our sins and asking for forgiveness should not be done only in the Lenten Season. Acknowledging God’s presence and commemorating Jesus’ death should not be remembered during holy week only. The Almighty Father is present always and He remembers us always so we too should reciprocate it. Jesus Christ did not die on the cross 2000 years ago carrying only the sins present during those times; He suffered on the road of Calvary and died carrying on His shoulders the shame and sins of all the people from the past; including us in the present and future times. Every day in our lives, we should acknowledge God’s presence and remember the salvation that Jesus Christ has given to us. We need to reciprocate it by abiding God’s will and reading the bible daily. Submit our self fully to the Lord Almighty and receive Jesus Christ in our life. God’s love is unconditional; he sees no wrong or right. He is the only constant in our life and in return, we should make Him constant in our lives also. All glory and praises to God! Happy Resurrection Jesus Christ! HomeChoice Planners and Construction Corporation that church on Monday; for short, HPCC.com is a bible study service done every Monday to the construction workers and admin of the company. For years now, bible study services between the construction workers and admin has been done separately; the workers at the warehouse and the admin in the main office. But for this year, it has been decided for the bible study service between workers and admin be as one. The joint bible study service started yesterday, March 11, 2013. Along with this joint service is a change in the program flow. It is not the usual flow anymore, wherein the pastoral staff and members of the CDO First Assembly of God church would lead the service. Starting yesterday, each workers’ team, including the HPCC admin and RPM Realty marketing officers were assigned a date to lead in the services. In this way, the admin and construction workers were given an opportunity not just to sit down and listen to the service but to be a part of it. The first team to lead in the joint bible study service was the structural team. Each members of the team were designated to do the opening prayer, welcome song, testimonies, scripture reading, offering and so on. The structural team did a good job in leading the service, encouraging other teams to do the same or even better. The management is glad with these changes done in the service because it will not only help the staff and workers to be a good follower of the word of God; but it will also mould them to be a good leader and sharer of the word. All glory and praises to God! HomeChoice Planners and Construction Company wouldn’t be where it has reached right now without the guidance of the Lord Almighty. 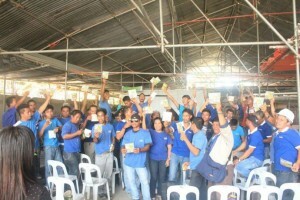 Four years ago, the company decided to minister a Bible Study every Monday morning for the workers. It’s a way of sharing God’s words and teachings to them; showing them what is the reason behind the company’s success. Letting them see that by listening and abiding to the word of the Lord, blessings do come and prayers are answered. And it was then that the company has started to conduct a Water Baptism for those workers who wanted to receive Jesus Christ fully into their lives. 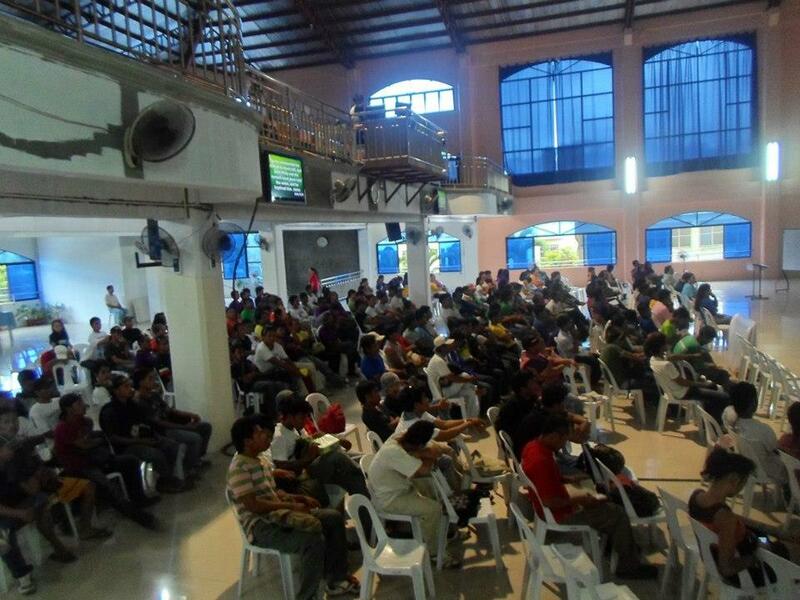 And last August 25, 2012 at the Maravilla Beach Resort; the Foremen and Engineers of the company, who are also believers of God, decided to truly receive and embrace Jesus Christ in their lives. We are so overwhelmed with how the Lord Savior works that yet another batch of workers has submitted their selves to Him. The company is a witness to God’s magnificent doings; and we are just in awe. With the Lord’s grace, HomeChoice Planners is really blessed to be a blessing unto the others. We’re pleased to be an instrument in spreading God’s words and love; inviting them as well to be disciples of the Almighty Father. 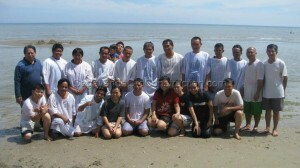 This water baptism service wouldn’t be possible without the CDO First Assembly of God Church headed by Ptr. Elpie Taboclaon. That is why we would like to express our heartfelt gratitude to their church. We would like to extend our warmest thanks also to the workers for their strong faith with the Lord; and also an overwhelming gratitude to our Father Almighty for everything. Be a disciple of God. Believe in Him. Receive and Embrace Jesus Christ in your life. Spread the good news! Lenten Season. It’s the time where in we take time to reflect upon our sins. The season that we think back of the things that Jesus Christ has sacrificed for our salvation. During this week also, we witness the different things that people do to repay all the sacrifices that the son of our God has done. Tradition it is, every Holy Week we can see some people doing sacrifices also; walking with their knees and praying at the same time, doing the way of the cross and the renowned crucifixion. Each and every one of us has varied ways in showing their repentance and reflection. 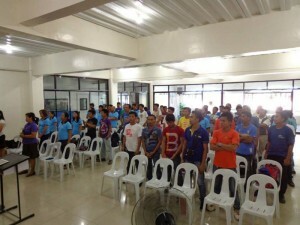 And we at HomeChoice Planners conducted a program last April 4, 2012 as our holy week activity. 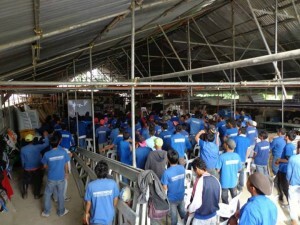 The program was held at the ‘bodega’ and it was attended by the construction workers and office staffs of our company. 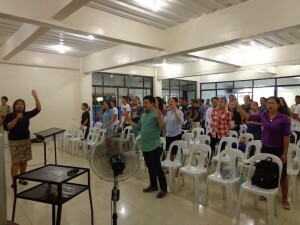 We invited the CDO First Assembly of God Church to minister the program. We were honored to have Ptr. Elpie Taboclaon, the senior pastor of CDO FAOG, who shared to us the word of God. Ptr. Walter Richie and Ptr. Lloyd Yana were present also. It was a short program but we’re satiated; in a sense that we were filled with so much learning about the word of the Lord. “It is finished!” John 19:30 – The seventh and last word of Jesus Christ before His death. It tells us that all of our sins have already been paid. The son of God sacrificed His self carrying all the burdens of this world and died on that cross. Jesus Christ did all of these because of His unconditional love for us. We need not have to sacrifice and hurt ourselves in order to pay back what Jesus Christ did for us. The message clearly said that everything’s done and finished. Jesus Christ announces here that all of our sins are taken away. All our guilt that should have been imputed to us but was imputed to Him was taken care of. Jesus Christ announced so that all could hear that our salvation is won and our sins are forgiven. In return for His unconditional love, the righteous thing that we have to do is to love Him back. Worship Him and acknowledge His presence every day of our lives. Be reminded that He is the only risen King. The Lord Jesus Christ is a complete Savior. He is a sovereign Savior. We should remain and be faithful to Him and His words. And so, we should be thankful and grateful to all the things he has done to our lives. How lucky we are to be the children of God, we are graced with so many blessings. As for our company, we too are thankful for all the great things that He has bestowed upon us. The Lord Almighty being our foundation and partner in the business is what makes us successful.